Full disclosure: I’ve never believed in the rapture. It’s nowhere to be found in the Scriptures, and the very idea of all true believers being snatched away doesn’t make any sense. How does that gel with the rest of the Bible? When the going gets tough, God just pulls you out of the world. Huh? 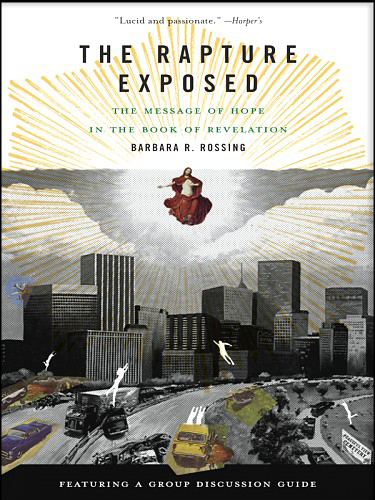 Barbara Rossing’s book “The Rapture Exposed” is a passionate and well-informed refutation of the dispensational, rapture-oriented theology of popular American fundamentalism as seen in the Left Behind fictional adventure series. Dr. Rossing begins her book by artfully laying out the case for the destructive nature of rapture/escapist theology. The unbiblical axiom “It doesn’t matter since it will all burn someday” is the grounds for committing deep sin against the world, and Dr. Rossing rails against the escapist worldview that fosters this thinking. Perhaps the most useful chapter of the book is the second, in which Dr. Rossing recounts the development of the Rapture from the vision of Margaret MacDonald in 1830, to its popularization by John Darby, and its cementation in the American theological landscape by Cyrus Scofield in the Scofield Reference Bible. She goes on to simultaneously delinieate and debunk the foundations of rapture theology through the proof-texting of various passages in Daniel, Revelation, and other New Testament books. This extremism is manifested through a strange, violent obsession with and pursuit of Armagaddon, which dispensationalists see as absolutely central to the prophecies of Revelation. But instead of Armageddon, Rossing posits that Christians should see the Tree of Life and the healing it offers as the central image of the Apocalypse. Rossing’s book does more than just challenge the unbiblical and heretical rapture theology, it offers an alternative vision and interpretation of the book of Revelation. She debunks the myth of the Rapture, and provides a sound exegesis for those “rapture-passages” that form the backbone of the escapist theology. She goes on to offer an alternative story, not one dripping in the blood and vengeful violence of the Left Behind series, but rooted in the healing and hopeful reality of the Tree of Life which flows from the throne of the Lamb. There is hope for the nations because the Lamb Who Stands But Was Slain, not the Wrathful Lion, wields the power of the throne of heaven. Lamb Power, not Tribulation Force, will have the final say, and all true believers will be right here, with feet firmly planted on the ground, to see it happen. What do you think of this alternative vision of the Apocalypse? Will there be a Rapture? Will things be as peaceful and healing as Rossing hopes and writes that they will be? Perhaps more importantly, what role should eschatology play in the formation of public policy? Ice’s mentor, Dallas Sem. president John Walvoord, couldn’t find anyone holding to pretrib before 1830 – and Walvoord called John Darby and his Brethren followers “the early pretribulationists” (RQ, pp. 160-62). Ice belittles Walvoord and claims that several pre-1830 persons, including “Pseudo-Ephraem” and a “Rev. Morgan Edwards,” taught a pretrib rapture. Even though the first one viewed Antichrist’s arrival as the only “imminent” event, Ice (and Grant Jeffrey) audaciously claim he expected an “imminent” pretrib rapture! And Ice (and John Bray) have covered up Edwards’ historicism which made a pretrib rapture impossible! Google historian Dave MacPherson’s “Deceiving and Being Deceived” for documentation on these and similar historical distortions. Other fascinating Google articles include “The Unoriginal John Darby,” “X-raying Margaret,” “Edward Irving in Unnerving,” “Pretrib Rapture Politics,” “Pretrib Rapture Secrets,” “Pretrib Rapture Dishonesty,” “Pretrib Hypocrisy,” “Pretrib Rapture Secrecy,” and “Roots of Warlike Christian Zionism” – most from the author of “The Rapture Plot,” the most accurate documentation on pretrib rapture history.